On the cover of the No One Knows Single, Josh Homme can be seen holding a Danelectro Convertible. In this source, Tom Waits is pictured holding and playing a Danelectro 5005 Convertible guitar with a pickup in it in white finish. Alain can be seen using this guitar in the video for the Queens Of The Stone Age song Little Sister. In this rendition of song "Nightingale", Sparhawk used Danelectro 5005 Convertible which had a different headstock than other Convertibles do. On his Facebook profile, Dunning shared his Danelectro Convertible, which he bought in 1995. 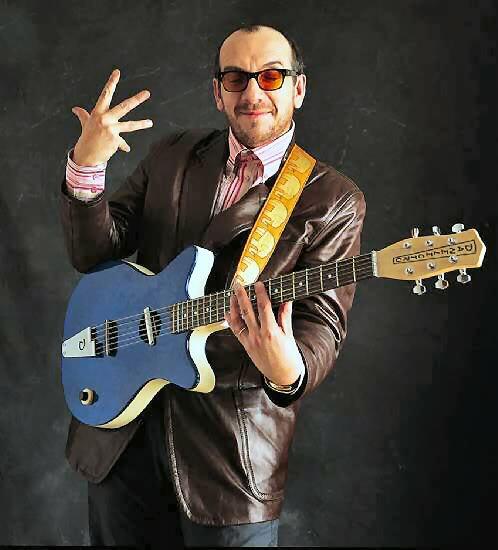 Costello is holding Danelectro Convertible model in this photo. Not much is known about this Danelectro, possibly using only for photoshoot purposes. Charly playing his Danelectro convertible. Johnny Nicholas mentions using a Danelectro Convertible when recording his Future Blues album in this [Guitar World article](http://www.guitarworld.com/interview-bluesman-johnny-nicholas-discusses-his-new-album-future-blues). Marcelo Camelo usa uma Danelectro Convertible semi-acústica desde o cd Sou. She posted this photo of her Danelectro Convertible which she plays through an Orange Tiny Terror. In this Instagram photo posted on Kogon's profile, he shows 2 of his Danelectro guitars. One is a Convertible, and one is a Dano Pro. The Danelectro Convertible was a hollow-bodied thinline acoustic/electric guitar based on the Shorthorn. It had a conventional round sound hole with a lipstick pickup mounted across the hole. The Convertible name came from the ability to play it unplugged as an acoustic guitar or plugged in as an electric guitar. The Convertible has the double cutaway shape used on Danelectro's DC series of guitars. The Convertible was originally produced in the 1960s. It was offered as a reissue between 1998 and 2001. The guitar is currently being reissued. The reissues differ from the originals in that they have mounted the pickup diagonally across the soundhole, and there is only one concentric knob as opposed to two separate tone and volume knobs. The reissues also have a cable jack located in the strap knob. The Convertible had a floating bridge and a separate tailpiece. On the Convertible, the tailpiece was used to hold the strings equally apart while the metal riser on the bridge was not notched, with the undesirable result that the strings slid back & forth on the bridge when the guitarist bent strings while playing. One of my dream guitars. Åsa from Akaba used it on a bunch of gigs.